His birth and death dates are disputed , even the century. Below we read that he was born in the Village of Khorni in Taraun.. If he was born in Khorni would not he be called Khornetsi? Where is/was Khorni also known as Khoronk? Above we see that it was a town in the Taron/Taraun region. Not much is said about it. Up until 1915 there was village Խորոնք/Khoronk in the Bitlis/Moush region with 50 houses, all Armenian. At the present there is a Khoronk in the Armavir region, Population (2008) - Total 2,333. (Armenian: Խորոնք, also Romanized as Khoronq; formerly, Lenughi Nizhniy Aylanlu, Nerkin Aylanlu, and Lenughi) is a town in the Armavir province of Armenia. The town's church dates to 1880. Hey Zartonk! Do you see the village named for you? Moses of Chorene, also Moses of Khoren, Moses Chorenensis, or Movses Khorenatsi (Armenian: Մովսես Խորենացի, Armenian pronunciation: [mofˈsɛs χoɾɛnɑˈtsʰi], also written Movsēs Xorenac‘i, Movses Khorenats'i, scholars have argued for either fifth century (ca. 410 – 490s AD), or a 7th to 9th century date) was an Armenian historian, and author of the History of Armenia. He is credited with the earliest known historiographical work on the history of Armenia, but was also a poet, or hymn writer, and a grammarian. The History of Armenia was written at the behest of Prince Sahak Bagratuni and has had an enormous impact on Armenian historiography and was used and quoted extensively by later medieval Armenian authors. Although other Armenians, such as Agat'angeghos, had previously written histories on Armenia, Movses' work holds particular significance because it contains unique material on the old oral traditions in Armenia before its conversion to Christianity and, more important, traces Armenian history from Movses' day to its origins. He is considered to be the "father of Armenian history" (patmahayr), and is sometimes referred to as the "Armenian Herodotus." Sometime ago, in another post I seemingly erroneously attributed to him his letter of appreciation to a certain Sahak that I assumed was St. Sahak Partev. Even though he had had contact with the Catholicos as a student, this Sahak in question is Prince Sahak Bagratuni, his sponsor and mentor who had urged him to write his masterpiece The History of Armenia. Edited by Arpa, 04 November 2011 - 04:53 PM. The presentation of the updated version of “History of Armenia” by Movses Khorenatsi (translated by Gagik Sargsyan) was held today at Yerevan State University (YSU) Faculty of Oriental Studies. Head of Chair of Iranian Studies Vardan Voskanyan and the representative of the initiating group Karen Igityan delivered a speech. The organizers stated that the book had been supplemented with colored historical maps and illustrations of Italian painters of 15th century. They also mentioned that the number of references had been updated in correspondence with current scientific requirements. The book is addressed to the large audience and aims to present Armenian History not only within scientific framework, but also, more impressively introduce the events of those times with the help of colored illustrations. 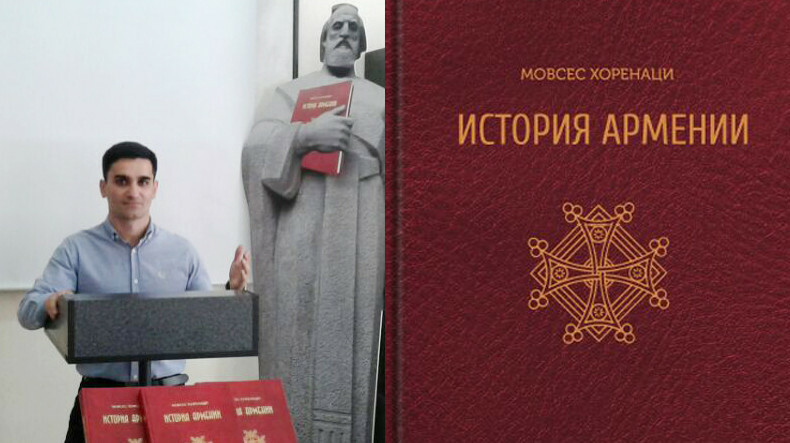 The idea of the book publication belongs to deceased representative of Armenian community of Pyatigorsk Hrat Sarkisov. He attached great significance to publication of Russian-language books about Armenian history and thereby dissemination of historical facts about Armenia within both Armenian community and Russian-speaking people of other nationalities. The organizers mentioned that Alla Ter-Sarkisyanc (Doctor of History, Russion historian and ethnographer), Valeria Esayan (Candidate of Philology), Varsenik Hayrapetovna (Candidate of Pedagogy, Victor Akopyan (Candidate of History, Associate Professor), Gohar Arustamova (Armenian language teacher in Armenian school of Pyatigorsk) and Karen Ghazaryan (Historian) have worked on the updated version of the book.